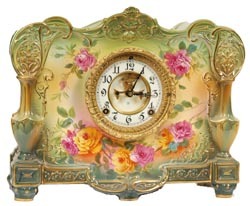 Ansonia Clock Co., Royal Bonn, "LaRoca", ca 1901. An imposing case, large at 14.25" wide, and 11.75" high. It appears much larger. Case style is very unusual, but arent they all. Primary color is green, again dark at the base, getting lighter as you reach the top. A goodly amount of gold accent. Urns on the corners, filled with flowers. As usual the flowers are around the dial and on the sides. Flowers are yellow and rose. Ly-Ansonia No. 2589.